This pasta dish of Asparagus, Crisp-Skinned Sockeye Salmon, and Linguine is tossed with a delicious Lemon Butter Parm-Reggiano sauce. 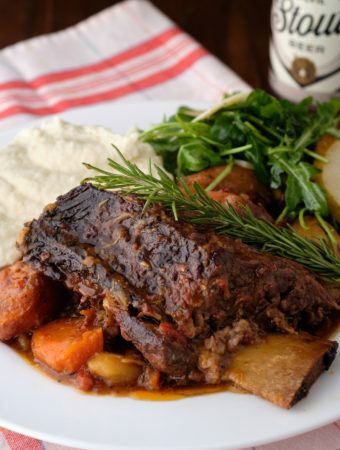 It’s inspired by a few different springtime recipes and takes a twist on a classic French sauce. Who else is ready for the spring harvest and for farmers’ markets to open up?! I almost forget it was spring here in Philly cause it’s still dipping into the 20s at night (come on spring, I’m ready to trim my winter beard!). As much as I love the open-air markets, I hate walking out into a bone-chilling cold morning to get there. Fortunately, the grocery store recently stocked some organic asparagus to whet my springtime appetite. Whether you get your asparagus from the grocery store or from your favorite farmers market, how do you go about preparing it? Steamed, Broiled, Roasted, Grilled, pureed into ice cream?? I love Asparagus simply roasted with garlic then tossed in pasta with olive oil and tons of lemon juice. I also really love it served along with salmon. I don’t know why this is such a classic combination – like steak and potatoes or chicken and broccoli. Let me know if you have any thoughts on this. Sometimes, if you get salmon and asparagus at a restaurant it might come with a hollandaise sauce. Hollandaise is wonderful but I think a little heavy to serve as a spring-inspired pasta sauce (or is it?). I knew I wanted to pull together the asparagus, salmon, and pasta with lemon, white wine, butter, and maybe some reggiano but wasn’t sure how to pull that off. So I developed a twist on a classic French sauce. 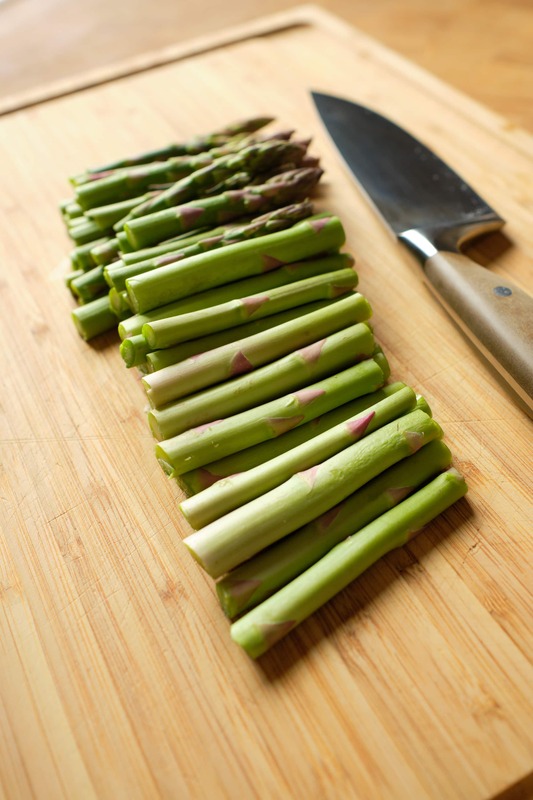 Chop asparagus in to 1 1/2 to 2 inch pieces. If you reduce white wine and lemon with some shallots then slowly whisk in cold butter you’ll have a Beurre Blanc. It’s a tad time consuming but incredibly easy and worth it. If you add parmesan reggiano you no longer have a classic beurre blanc. 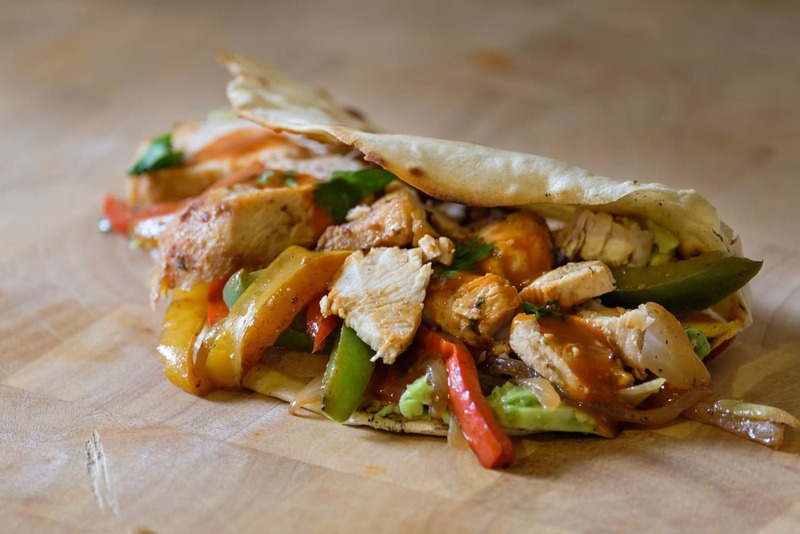 Yay – fusion foods! I think this sauce came out great and achieved the goal of bringing together these three main ingredients. If nothing else, I think you should make this recipe just to say you’ve made a beurre blanc. Reduce Lemon Juice, White Wine and Shallots to about 1/4 cup of liquid. 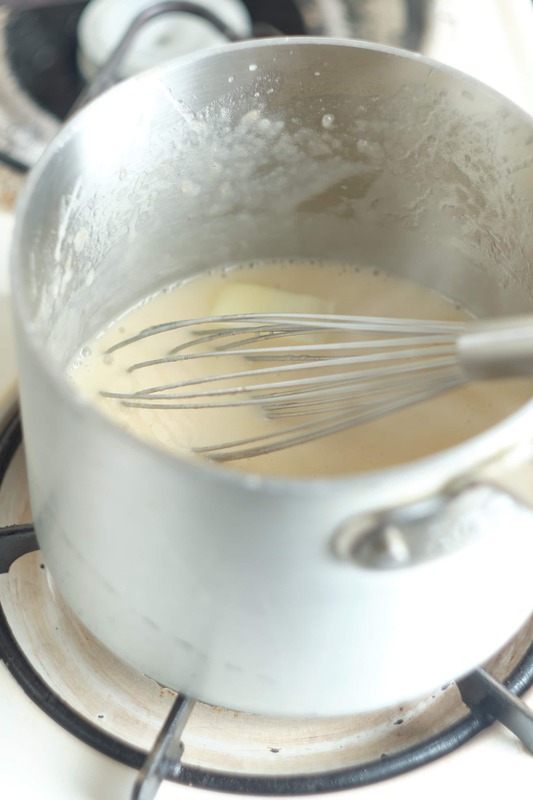 Whisk in one tablespoon of butter at a time until each emulsifies with the liquid. Finish Lemon Beurre Blanc with some Parm Reggiano. You can prepare the salmon any way you’d like for this recipe. You could serve it alongside the pasta or broken up and tossed with it. I chose to pan sear it so the crispy skin would add some texture tossed in with the asparagus and linguine. 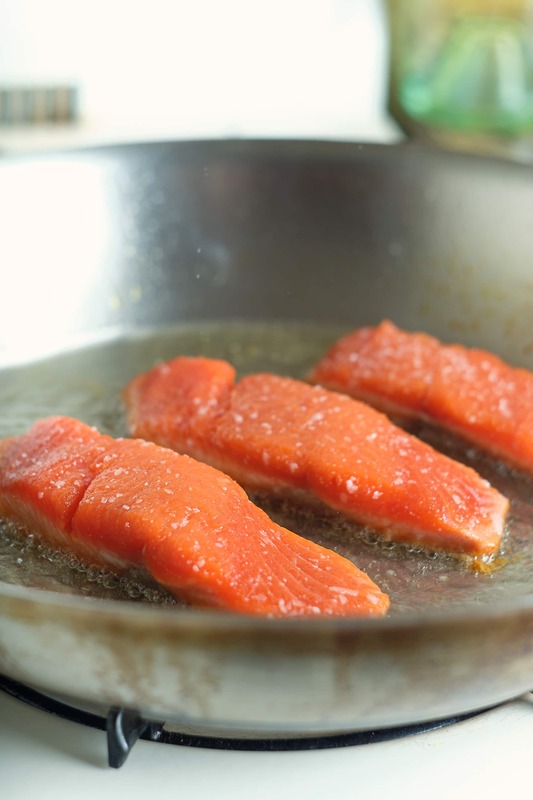 If you’re going to broil or bake or poach your salmon, you might want to remove the skin before serving in the pasta. I suggest using wild salmon if you can find it. Wild is less fatty than farm-raised salmon so I just think it’s texturally more pleasing in this dish. To pan sear the salmon, season it liberally with kosher salt, sear it in some vegetable oil for about one and a half minutes skin side down then flip it for another minute. Set it aside to blot on paper towels while you work on the other elements. Portion salmon into 2 inch portions. Generously season Sockeye Salmon then sear skin-side down for 1 1/2 minutes in vegetable oil. Flip and fry for one more minute. Transfer to paper towels to blot off excess oil. I recommend starting this recipe with the beurre blanc sauce. In the time it takes to reduce the lemon and wine you can have the salmon seared and your pasta water boiling. Set the salmon aside then place your linguine into the hot water. About a minute before the linguine is done, toss the asparagus in the same pot. Drain the pasta and asparagus then transfer it back to the pot. Toss the pasta with the lemon beurre blanc so it’s nicely coated. Fold in broken portions of salmon along with a handful of chopped parsley. Serve with lemon wedges and (of course) extra parm regg. 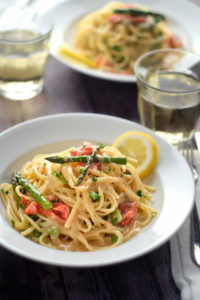 Asparagus, Sockeye, Linguine with Lemon Butter Sauce can be served hot, cold, or at room temp. I’ve been taking more time to test and develop my recipes lately. I’m trying to incorporate classic foundational techniques and ingredients. 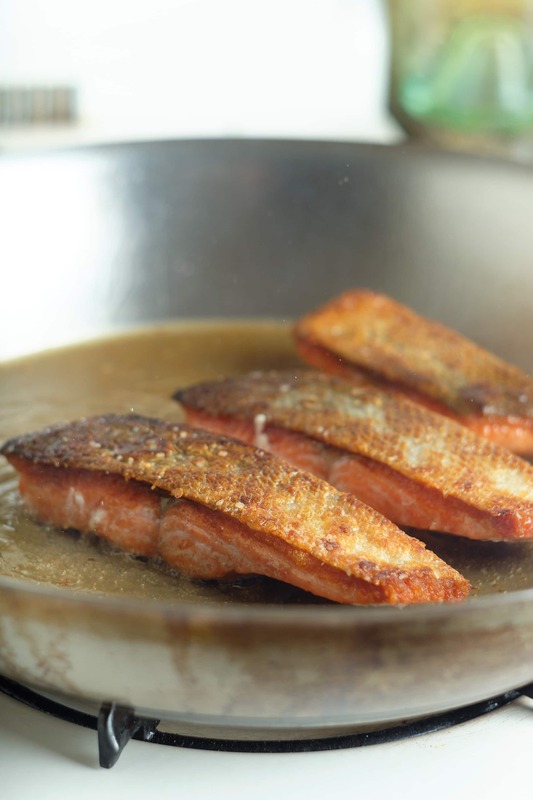 This recipe involves boiling water for pasta and blanching asparagus, pan searing crispy salmon, and a super classic French sauce called a Beurre Blanc. The sauce takes about a half hour to make because you’re reducing liquid and whisking two sticks of butter one tablespoon at a time. Otherwise, this is a super easy recipe that anyone could pull off. 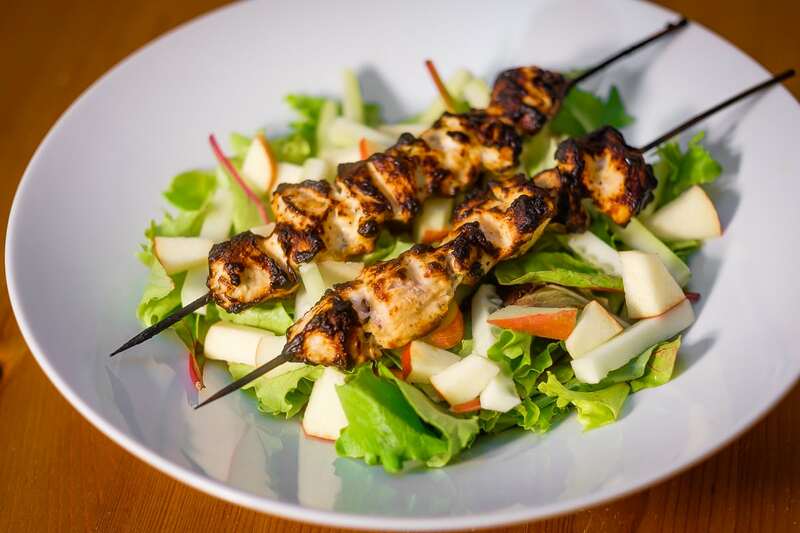 If you don’t like salmon, you could very easily use chicken or mushrooms. Heck, add some bacon and top with breadcrumbs while you’re at it! Enjoy! 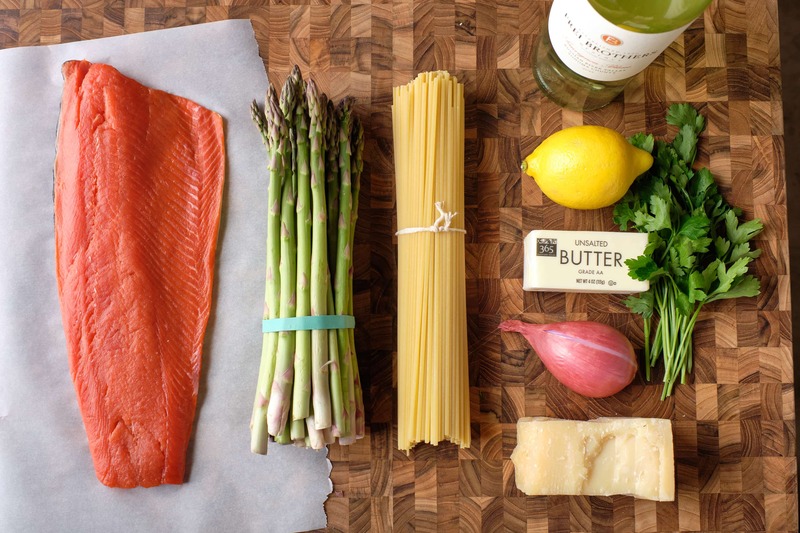 This pasta dish of Linguine, Asparagus, and Crisp-Skinned Sockeye Salmon is tossed with a delicious Lemon Butter Parm-Reggiano sauce. 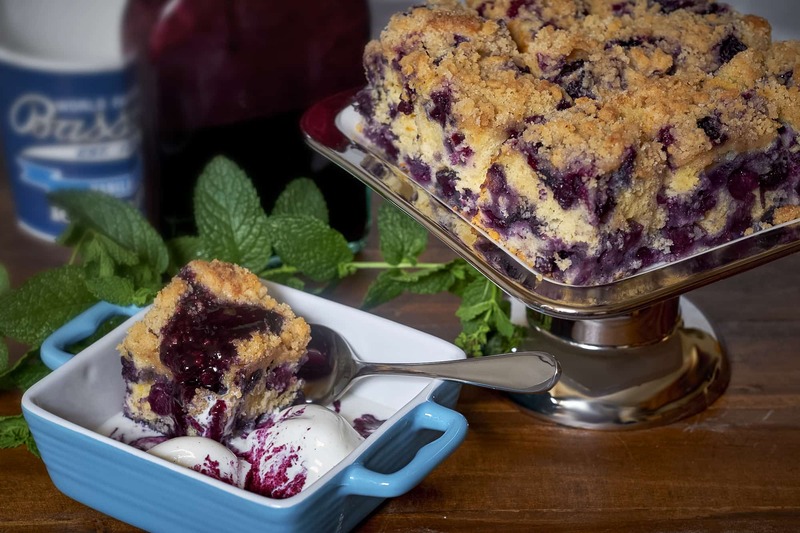 It’s inspired by a few different springtime recipes and takes a twist on a classic French sauce. Simmer shallots, white wine, and lemon juice in a small pot until reduced to 1/4 cup. Reduce heat to low. 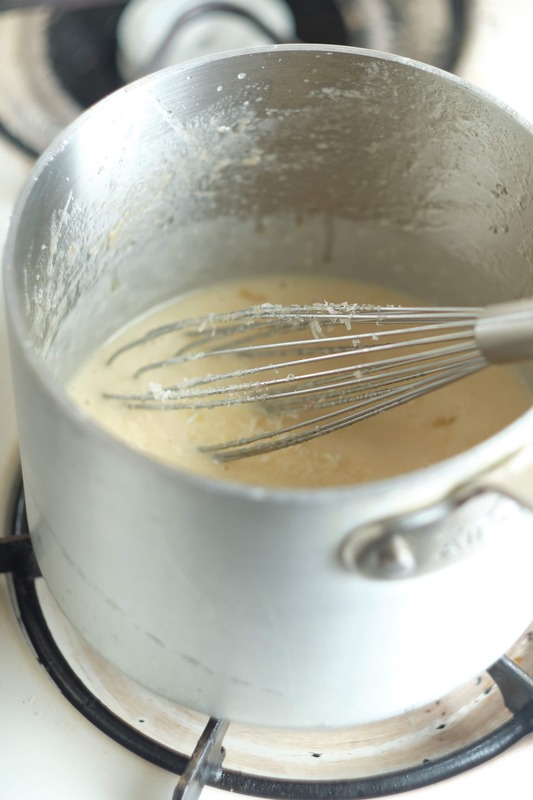 Whisk in 1 Tbs of butter at a time until fully emulsified. Whisk in parm reggiano and parsley. Season with salt to taste. 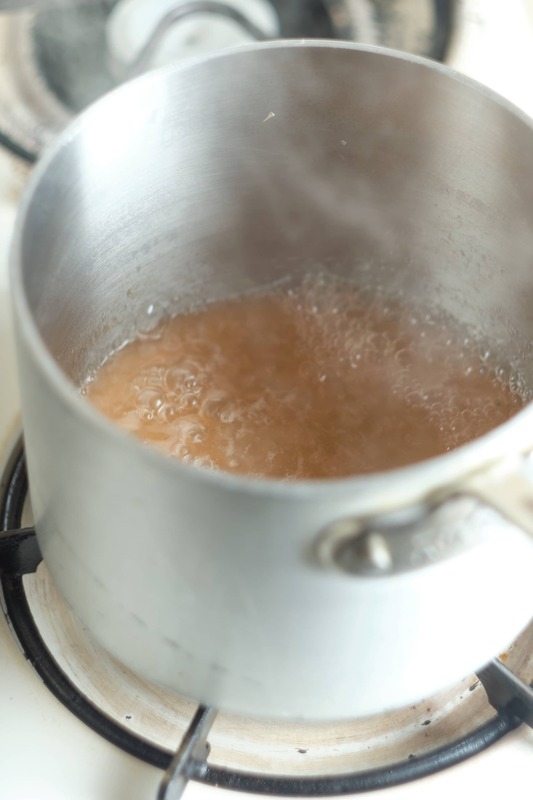 In a large stock pot, bring water and salt to a boil. Chop Asparagus into 2-inch pieces. Add asparagus to the pasta water 1 minute before its al dente. Drain pasta and asparagus and return to stockpot. Add sauce and toss to evenly coat. 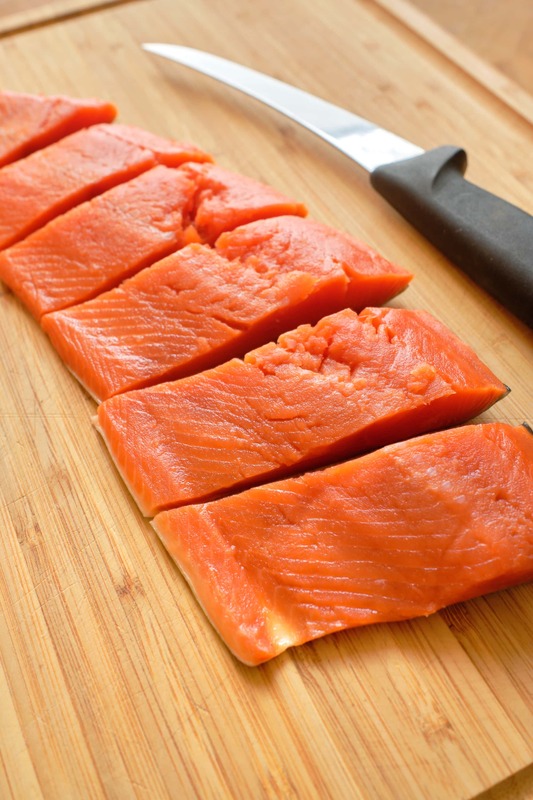 Cut salmon into 2-inch portions and season liberally with kosher salt. Sear Salmon on high heat for 1 1/2 minutes skin-side down, flip then heat for one minute. Alternatively, broil salmon in the oven for 2 minutes per side. Salmon can be tossed in the pasta or served on the side with some reserved lemon butter sauce.